There's a new type of fantasy football game in Beta and ready to play. It's looking good. It's called Football Trader and is a more or less equivalent to a real-time fantasy football stock market. Below is an overview from the creators and some tasty screenshots. I've had a little play this week and really enjoyed it - it's got so much going for it. The key thing that draws me in is that it's real time. Being quite keen on fantasy football (never!) it can seem like a long time between gameweeks sometimes, especially if you've had a bad one and you want to put it behind you. With Football Trader being real time you can buy and sell players at any point to take advantage of goings on in the real world. There are graphs too. Lots of them. And numbers. And graphs! Oh Boy, I can see myself getting sucked into this! It is in Beta and plans are to launch for real next season. The guys are trying to get a critical mass of people involved playing it for the rest of this season, around 100 players, so that they can optimise the playing experience. If you can't get enough of fantasy football and need that extra hit through the week make sure to check it out and give the guys your feedback so they can make it the best they can. Go Play! Football Trader is a new type of Fantasy Football game where you Buy & Sell shares in players on a live stock market called the PlayerDAQ. 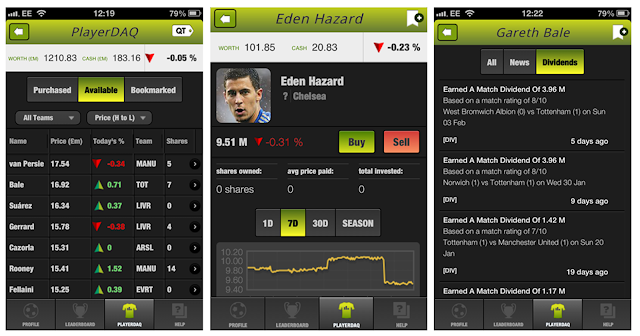 Unlike most fantasy football games, this is played in Real-time, meaning the price of players is changing constantly based on users trading on the market and also player performances in real life games. Every user starts with £100M budget and the goal of the game is to Grow the Value of your Players, and therefore your Team, as much as you can. What makes the game different to traditional Fantasy Football games is that it's all about investing in players, as opposed to picking a team for the weekend. Finding good value in players is something a lot of fantasy football players look for, but this is always outweighed by having to look to pick players who we think will score or assist or keep a clean sheet. In Football Trader, you look to Invest in players and sell them when you think their value has peaked. You also get Match Dividend Bonus cash added to your cash balance after the weekend's matches that gives you extra money to buy more shares in players. This dividend is based on how your players performed in their matches. There is also a tonne of features, including Live Historical stats and Breaking Player News - something not seen in fantasy game before. The Beta game is now open Live for users to play till the end of the season and can be played from a mobile or a web browser. Football Trader plan to launch native apps very soon. henry - this post was spammed by robots, are you a robot?